Reflections: Happy Republic Day Everybody:-)!!!!!! The day is also special for the Australians, Wishing everybody in Australia a Happy National Day!!!!!! And the day is extra special for me coz its my birthday:-). What plans, you’ll ask. No special plans as such, coz unlike in India where it is a holiday, today is like any other working day in the UAE. The better-half has gone to work though the kids have a holiday coz they study in an Indian school. So as of now the kids & I have planned to bake a French vanilla cake with chocolate frosting and some fancy icing …..I usually wind up tearing out my hair by the end of these baking sessions but since its my birthday & they need a break from their tests I have mentally promised the kids that I’ll be on my best behaviour:-D.
I know I know I have been neglecting my blog past 2 weeks. You see, the kids are having tests at school whole of this week & next….. teaching 2 children who think ‘tests are boring’ leaves me all frazzled by the end of the day. Have also been nursing a toothache for a few days now and finally went to the dentist on Saturday when I could bear it no longer. By the end of the visit I was in tears with all the pain she was inflicting on me. Have 2 more sessions to go. Both the dentist & I are not looking forward to it ;-(. So that’s all the news from my end. What about you???? Tell me what happening with You & how you are planning to spend ur day???? Enjoy ur day, may u have many a reasons to smile. happy happy happy bday!!! :) wishing for u loads of love & laughter today! Happy Birthday, Happy Republic day and Happy baking Nancy.. The day is like any other day except for the memories and the reminder of our history as a nation.. It would have been watching the parade n all in India but here the lovely patriotic posts from fellow bloggers is making up for that..
n yes, we miss the holiday.. sigh. The cake sounds yummy...Have a nice time and Enjo!!! Nancy, i was busy getting pipe bands to play, parading the troops, distributing sweets and arranging cultural programmes to celebrate your birthday. I also hoisted the national flag as it happens to be our Republic Day too. In that whole rigmarole i forgot to wish you. So here wishing you many happy returns of the day. God bless you with long and healthy life. Happy happy happy birthday nancy!! Wow! What a day to be born on! Hope u have a great day and hope the cake turns out super-duper! Many happy returns of the day!! :) Wishing you the best in everything you do. Cake - hmmm, sounds yummy! Hope you and the kids have fun making and eating it. All the best for the kids tests. I am sure you have to work more hard for the exams than the kids themselves! Have a great day and waiting for your next post. Take care. Happy birthday, pretty lady and good luck to your girls. Test ARE boring. Happy Happy Birthday N. Have a wonderful day with lots of joy and celebrations. I'm sure the girls have planned a surprise - write about it in your next post please. Btw , one essential difference with the Aussies is that they are celebrating letting the Brits in and we are celebrating sending the Brits out ! And thank U for ur wishes!!!!! Hitchwriter: Thank U...I hope so too[abt the awesome year I mean];-D!!!! No birthday wishes for me;-(????? Tanushree Pillai: Thank U so much:-))!!!! Balvinder Singh: My goodness u have been busy;-D. LOL mujhe pata tha aap bhoolengae nahi;-D.
Hope ur republic day celebrations went off fine:-))!!!! Preethi Shenoy: The muffins[slight change of plans;-D] turned out wonderful, thank U!!!! And yes it is a wonderful day to celebrate my birthday tho I never appreciated it when I was in school[never got wear colordress & go to school u see;-P]. Divya: Ur father too......please do wish him on my behalf:-)). Thank for all the wishes:-))!!!!! Elizabeth: I too watch the parade on Tv but somehow its not the same anymore...maybe I'm missing good ole commentating on doordashan;-(. Happy B'day Nancy!!! Hope you have a WONDERFUL DAY!!!!! I know once you have kids, you concentrate more on their special days...but remember to enjoy yours as well! Hope you enjoyed the day in your own sweet way, baking with N&N..
Hope you had a wonderful birthday- so glad the muffins turned out okay- what lovely girls you have, wanting to bake for you!! so do we get to see the magnificent bday cake? A very happy bday Nancy! How was the baking session? French vanilla cake with chocolate frosting sounds yummmm!! Many More Happy Returns of the Day.. Hope you had a great day. Hey Nancy !!!! HAPPY BDAY TO YOU !!! Hugs and loving wishes for a wonderful year ahead !!!! Thats a great idea to bake a cake for ur bday !!! If we had been near, I would've baked for you !!! All the best to the girls, for their tests. I am sure that they'll do well. 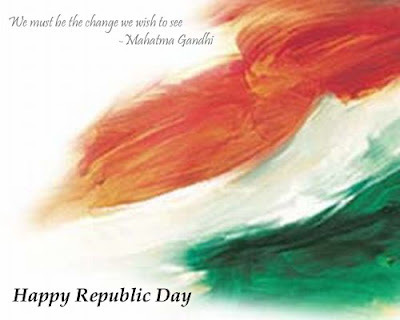 And, Happy Republic Day to you !!! The whole day was spent cooking, for me. Holidays - no rest !!!! Week days are better, I think. Wishing you a very happy belated bDay! And happy republic day too! How Is your tooth ache? Happy Bday Nancy. Hope you had a great day. This time of the year is special for me too. Got my kiddo's bday and my wedding annv as well. Hope u had a wonderful birthday Nancy!! Wish you many happy returns of the day! How did the baking go? Here are belated wishes - hope you had a wonderful day and wish you a wonderful year ahead with many more special blog posts (only I can do a selfish wish). Wow Happy Birthday to you Nancy!!! So basically you baked your cake and had it too.....well I am glad to know you spent your special day in a special way, I love baking with kids, the way they enjoy it makes you enjoy it even more. Good luck with your dentist appt,I have seen everyone dreading the dentist appt and I always wonder why??? Would you believe me if I say that I HAVE NEVER BEEN TO DENTIST ALL MY LIFE, 8-), that is also the reason why I dont understand the FEAR assosiated with it. From that elaborate cake you mentioned, to the cupcakes u actually ended up making, you are just too much! Hope the kids enjoyed their cupcake. Anjuli: The muffins came out really good....made 3 batches & its almost over;-o.
Sakshi: "I am such a lazybones that I take a complete off on my bday from my worldly duties"
Lostworld: So u know 2 people who were born on the same day. By now I know 4 people born on the same day & 1 anniversary;-D.
Aah u spent it with the kids....lovely, I'm sure there wd have been atleast 1 song-dance with "Saare Jahaan se achcha";-D.
Never Ending Memories: Thank U, I had a wonderful day:-))!! Umsreflections: Thank U so much:-). Oh they usually do well but till it is over there is an edginess;-(. Cooking huh....lots of guests I bet, still it must have been lots of fun;-)). Yes thanks I had a good day:-)!!!! Hope ur special days went off well too!!! Hey, A very happy B'day to you !! Glad that you got to spend the day with your kids!! And a very happy Republic day also !! Happy Belated Birthday Nancy! Sorry to hear about the dentist sessions. Not pretty..Cake sounds yum... Tell us how it came out. Again hope you had a fabulous frazzle free day!! Belated Happy Bday Nancy..May you get what u wished for this yr !! Wishing for you loads of love,luck and cheer. By your description I guessed you are getting RCT done fore your tooth. Good luck with that Nancy. I hope your next few visits are pain-free. Destination Nowhere: Thank U, I had a lovely day:-))!!!! Sadiya: "So basically you baked your cake and had it too"
LOL u can safely say tht...I was actually trying to avoid a store-bot cake filled with rich icing and the works;-P.
Butterfly: There was not much difference really...instead of 1 pan they were poured into 24 moulds and later frosted with the same frosting and icing. Yeah the kids were thrilled with it;-). Blunt Edges: Thank U....even late wishes are warmly received:-))!!! Rashmi: Thank U so much for all the lovely wishes:-). Chatterbox: I had a lovely day, thank U!!!! Snow: Aah so glad u liked the cake;-D. Thank U:-))!!!!! Hehe I just checked ur page today & wondered where u were....its ok, blah moods are our janm siddh adhikaar. U tek care!!! !